This booklet belongs to NORMAN M. NUTTER (#33931651) of Cumberland County, Pennsylvania. Norman Nutter was born on August 12, 1916 in Princess Anne, Somerset County, Maryland. He had a high school education for three years and his civilian occupation was listed as "cooks, except private family". He lived in New Cumberland, Pennsylvania until he enlisted on March 16, 1944. 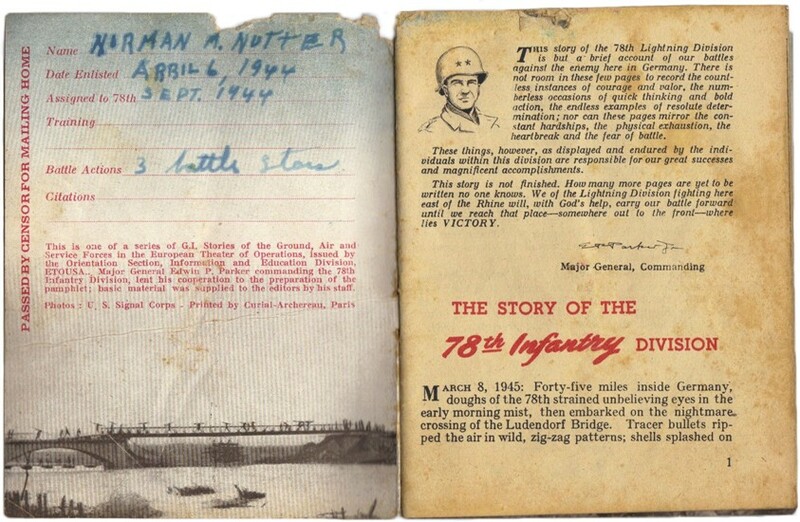 He was assigned to the 78th Infantry Division in September 1944. As a Pvt. with the Lightning Division, Nutter earned 3 Battle Stars. Norman M. Nutter lives in Delmar, Sussex County, Delaware when he died on May 12, 1994. If somebody has some more information on Norman Nutter please don't hesitate to contact me! !